Airline radios were distributed by retail giant Montgomery Ward, both within their stores and through their catalogs. Various manufacturers made radios for them through the years. This particular one is believed to have been made by Belmont of Chicago IL. Stepped waterfall top, beautiful colored dial, large airplane style dial pointer with a smaller split-second dial pointer and a bright green magic tuning eye. Quite a lovely set and they don't come up for sale too often. The cabinet has been refinished using the very finest toning and finishing lacquers, producing a gorgeous luster. The dial cover has been replaced with a new one so that you can enjoy the colorful dial. The electronics have been completely restored (no shortcut repairs, internally fused for your safety and has a new polarized power cord), and it plays very nicely on both the AM broadcast band and the two shortwave bands, as you'd expect from a seven-tube (including the eye tube) super-het set. 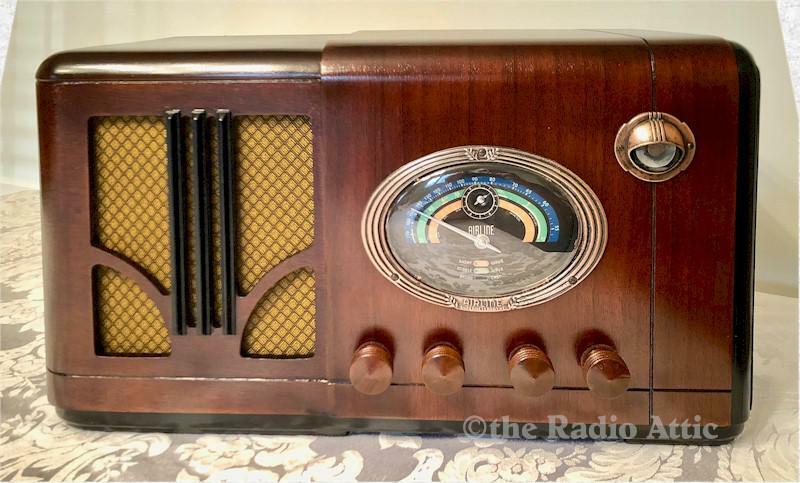 This radio has an amazing sound you're sure to enjoy! 17-1/2"W x 10"H x 8-3/4"D.